Pin It My mom was the first person to show me how great a baked squash can be. She slices acorn squashes and bake them with a little olive oil and salt. Very simple and yet tasteful. I decided to make it a little different, adding sweet maple syrup and cinnamon. I used candied walnuts that I keep in my pantry, but regular ones will do just fine too. This is a beautiful dish that would certainly impress guests. It can be a side dish or a main vegetarian entry. Cut off stem and bottom of the acorn, so it has a flat surface on each end. Half the acorn and scoop the seeds and pulp out. Place the halves on a greased baking sheet and fill each one with 1 tbsp of syrup, 1/2 tbsp of butter, 1/4 tsp of cinnamon, salt and pepper. Mix it up and spread around the edges (I used a brush for it). Place the nuts, chopped as well as the raisins inside the squash cups. Bake it at 350F for about 40-45 minutes. Every once in a while, if the squash edges are getting too dry, baste it with the syrup mixture, either using a brush or a spoon. If you are cooking for one person only, make only 1 half of the squash. I favour this recipe (found at the foodnetwork site) over many others from different chefs simply because the nuts are bakes and not deep fried. Mix all ingredients except walnuts. Bring a large pot of water to a boil and blanch the walnuts for about 4 minutes. Drain well and immediately roll the walnuts in the sugar mixture. Place them on a baking sheet and bake at 350F for about 10 minutes, watching carefully because the sugar can burn quickly. Store in an airtight container. "My mom was the first person to show me how great a baked squash can be." 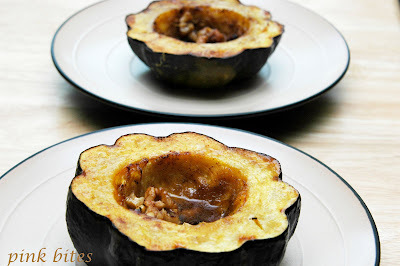 Oh my, that baked acorn squash looks absolutely DELIGHTFUL with the raisins & walnuts - yum! This is a great way to enjoy squash! 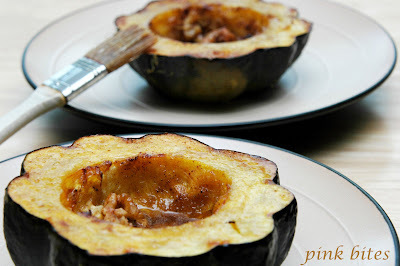 I need to take more advantage of using acorn squash. I think I've only made it once. I love squash with a sweet addition. This looks so good! Lori - This dish is a bit sweet, and I like that the nuts have a bit of a spice in it. oh my gosh, yum. 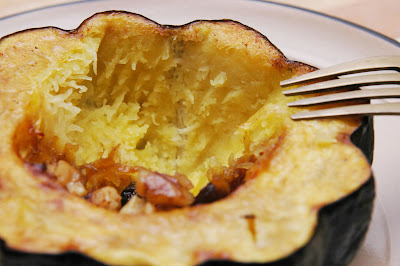 i love acorn squash most out of all the winter squashes -- probably because they're a little bit easier to cut in half! this looks like an awesome twist - I always do mine with butter and parmesan cheese! Thanks Katy - acorn is my favourite too!